Founded in the Chicago suburb of Melrose Park near 23rd and Division. 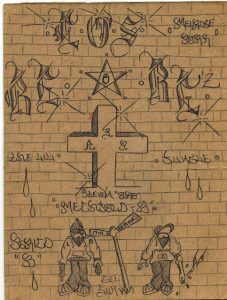 The reason I am writing a history for the Almighty Los Be Be Stones is because this is a gang that has come up on many Chicago area gang lists, not only that they have had some activity in the city of Chicago in the Uptown neighborhood. One of the members of the Be Bes reached out to me about the history when I worked for Chicagogangs.org and a page was done with pics provided while I rewrote the history I was given by the member, for some reason the history for the Be Bes was taken down and a message saying it needed to be revised was put up, I never knew why it was taken down because it was not my site I only worked with the site, but now I have master control of this site but I lost what I originally wrote, luckily I dug up an old email from the Be Be member and I have rewritten it. The story begins in the year 1983 at the intersection of 23rd Street and Division Street in the suburb of Melrose Park when 6 Mexican youths got together to form their own crew BJ, Frankie, Nopaul, Big Juan, and the Franco brothers. The youths called their crew the “Los Bebes” (means the babies in Spanish) and they formed to protect each other against the growing number of gangs moving into Melrose Park, Franklin Park, Stone Park, Maywood and Bellwood areas. The Gangsters Disciples and Vice Lords were especially trying to expand their territory in all three of these suburbs and the Gangster Disciples, Simon City Royals and Imperial Gangsters were giving these youths a hard time. 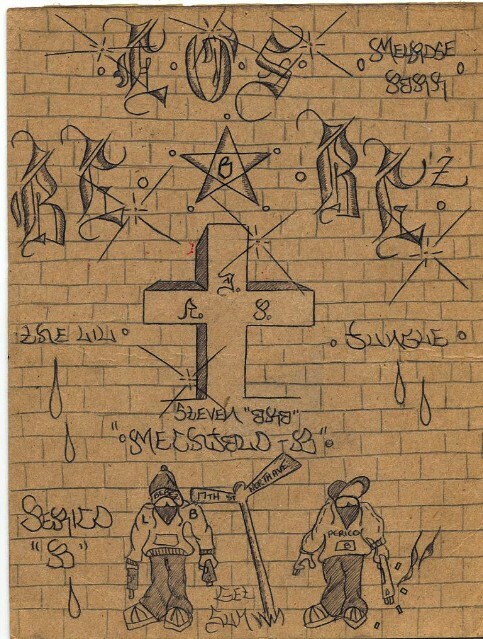 The only gang that befriended the Los Bebes was the Latin Kings but the Los Bebes did not join the Latin Kings instead they expanded as a force of their own and grew a great deal in numbers in the Melrose Park suburb expanding to the intersection of 16th and Lake where they conflicted with Maywood street gangs like the Gangster Disciples. As the later 1980s ushered in the Los Bebes became so popular they spread into the suburbs of Addison and Villa Park as they fought with an assortment of other gangs mainly within the Folk Nation alliance. It became clear that the Folks were the biggest enemies of the Los Bebes and in 1991 the Los Bebes were taken into the People Nation alliance under the wing of the Latin Kings at first. After joining the People Nation the Los Bebes spread in popularity even more as they opened territory in the suburb of Glendale Heights at the intersection of Glen Ellyn and Fullerton, in Westmont in the Eagle Creek apartments at 61st and Williams, in Villa Park at North Ave and Kramer Ave in those apartments (now private condos), In Berwyn at 23rd and Lombard and the suburb of Northlake. The Los Bebes also had some older members open a section in the city at Sunnyside and Clark in the Uptown neighborhood. Between the years of 1991 and 1995 the Los Bebes were at their peak of strength, then in 1995 the Los Bebes began to shrink in size and had issues with keeping sections for unknown reasons, this prompted the Los Bebes to turn to People Nation allies the Black P Stones for assistance, the Stones then took the Los Bebes into the 21 brick Stone alliance and the gang became “Almighty Los Bebe Stones” and adopted Stone colors of black and red in 1995. This new unity ended up hurting the Bebe Stones because they became a larger target by black street gangs with heavier firepower and sections started closing down causing them to lose Melrose Park, Addison and most of Villa Park. After the 2000s decade the rest of Bebe Stone sections closed. Please send in 1980s and 1990s pics, especially 1980s pics! Where the founders always the leaders? If not who were the leaders after them? What exact year did each section open and close down? Who were the biggest enemies of the Los Bebes?